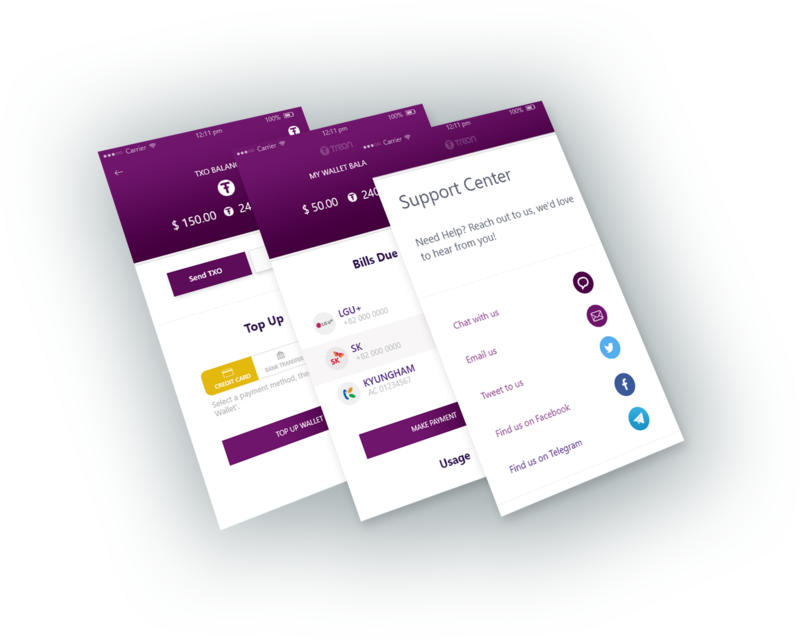 While this revolution is gaining wide acceptance, Treon, a token based mobile dashboard and wallet solution for utility bill payments, especially designed for the billions of customers using public utilities to settle their bills using blockchain smart contract technology has arrived. Treon is a token-based mobile application offering convenience in viewing and paying utility bills all at once in a single user dashboard. Using the blockchain technology as backbone, paying the bills with just a click is what Treon meant by its “smart contract technology”. You can pay the bills using the TXO currency of Treon which is based in the Ethereum blockchain. TXO offers a secure way in paying the bills using a mobile application where utility companies are connected as well which results in a single dashboard view of all your utility bills in real time and ready in one go. This solution provided by Treon will allow people from borders to borders or across nations to pay the necessary utilities at the comfort of their homes without leaving. The fast-moving digital economy is another reason to be a part of this project. The users can enter the new and unknown world of cryptocurrency by just paying their regular bills. This will increase the participation in the cryptocurrency market. The tokens or the digital money is used on the platform to speed up the processes of payment. The corporate sector and the energy and telecom sector will be able to see a surge in quick and timely payments. Mobile phones have become the most accessible media and TREON makes bill payments equally accessible by launching it as an application for cell phones. Treon’s business model is based on multiple revenue streams coming from different utility services, mainly from distribution margins, transaction fees and platform usage fees. Treon (TXO) will realise healthy margins while delivering significant savings to utility providers. Treon gives back rewards to customers against using TXO tokens to make adoption and usage much more appealing. Additionally, such savings will be the catalyst for utility companies to move their cross - trade contracts to the blockchain in order to cost-effectively manage their business dealings. Through the consolidation of the above margins and fees, Treon business model is built to address a growing global market and be a true partner to utility providers, bringing real value to consumers and providers alike. With a click of a button, you will be able to buy tokens (TXO), view your usage and influence your payments for all your utilities anywhere in the world. Combines the ease of using one interface through multiple payment options to settle bills from Utility companies on a single dashboard. Decentralized utility payment gateways and processing wallets applications built for all customers worldwide including those without bank accounts, with a simple and consolidated smartphone app to manage and pay all your payouts across various utility accounts. Treon will ensure the integrity and security of e-wallet using a smart blockchain Ethereum contract that works like a multi-signature (multi-bill) wallet. We partner with several expert cryptocurrency purses to provide Treon (TXO) users with the best experience of the crypto ecosystem. Treon (TXO) aims to bridge the gap for those who do not have bank accounts by providing easy access to the currency that can be used as a settlement tool for various utilities - offering the best service and value for money. Treon (TXO) offers the ability to fully and optimally manage multiple utility services on a single interface - a simple dashboard that covers all customer needs. Utilizing Treon's ecosystem, customers will be able to complete their payments for each of their utilities using methods that are safe, secure, smooth and usable. The Treon Token (TXO) will be based on the TPP ecosystem. The TXO token is the payment mechanism for utilities adopting Treon Payment Protocol (TPP). It will initially build on the ERC20 standard interface but will extend the money transfer process so that advanced payment methods can be utilities. The TXO token is designed to be different from current cryptocurrencies as it will allow comprehensive all-in-one billing mechanism to be implemented in a flexible way. Secure, reliable, and robust wallet to pay bills from one place using the currency of choice. As described before, customers will receive loyalty points when paying with TXO tokens, and that’s one of the strongest value adds of Treon. The Treon wallet is built with the flexibility to allow customers to transfer between fiat and TXO and other selected cryptocurrencies. Customers will have multiple ways to top-up the wallet with fiat currencies: credit cards (for banked customers), telecom recharge cards, over-the-air top-up, direct purchase of TXO through ecosystem partners (utility companies and their contracted distributors), or crypto exchanges. This token sale event allows participants to contribute to Treon and receive TXO tokens. TXOs will be used for customer accounts top-up, recharge, and bill payments on utilities network. TXOs are not an equity representation of the company. Smart Contract will distribute sold tokens after the completion of the ICO. Vesting schedule for team tokens. To preserve the value of the TXO tokens, all purchased token during the ICO as well as tokens earned:as bonus during ICO sales stages;as Airdrop tokens; and,as Bounty tokens will be transferred within 30 days after the last day of the ICO.